New Zealand’s hospitality industry reflects the diverse ethnic makeup of society, says Marisa Bidois, chief executive of the Restaurant Association. New Zealand’s food offering is world class, she maintains – and Bidois has had her fair share of dining out. As chief executive of the Restaurant Association, a membership-based organisation, the Auckland-based Bidois is in constant contact with restaurant owners, helping them with everything from professional development through to their legal obligations. Part of her job is seeing to employment disputes and advising owners but her passion is working on legislative reforms which affect the sector. New Zealand’s hospitality industry is worth more than $11 billion, employs 130,000 people and Bidois is often seen as its face – advocating for change and better conditions for those in the business. Right now, she is working on submissions for multiple Government reforms. Two are taking up a lot of her time: getting restaurant and cafe managers back on Immigration NZ’s skill shortage list; and a Government proposal which would require employers to be accredited in order to hire overseas workers. The association has already sent off its submission on restaurant and cafe managers and expects to hear back at the end of the month. The Government is also proposing to change the measure that assesses whether there is a skill shortage, from taking a national view, to one that looks at various regions. Bidois says the Government has taken inspiration from Scotland’s system and how it approaches hiring overseas workers. Asked if the reforms would have any negative implications, she says the ability to hire enough staff would probably worsen if businesses faced further restrictions. She says there is already a lot of pressure on the industry, but she hopes any changes will eradicate exploitation. Bidois met Immigration Minister Iain-Lees Galloway early last year to discuss challenges in the sector, including not having enough people to fill vacant roles. Finding staff – skilled and unskilled – is the single biggest problem for the industry, Bidois says, with some employers advertising for months at a time to fill managerial or leadership roles. Bidois was born in New Zealand and moved to the United States when she was two. Her father is Māori and mother an American. The oldest of five siblings, she grew up in Denver, Colorado, before making the move back to New Zealand at age nine. The family relocated to the Waihi Beach area and she did her schooling at Waihi Primary, Waihi College and Katikati College. At 15, Bidois returned to America with her mother, staying there until she was 18. She later came back to New Zealand for university, where she did a double major in anthropology and organisational behaviour. Like many people, Bidois began working in hospitality while she was studying. “My first job in the industry was working in a little cafe in Kingsland. I was a waiter and tried to learn the ropes and then as I was studying I progressed into other businesses,” she says. During that time she also worked in the senior common room at Auckland University, at Paramount Restaurant, considered one of Auckland’s best restaurants at the time, and then O’Connell Street Bistro. She later took a job at Hammerheads restaurant where she worked her way up into the position of maitre d’ and later assistant manager. 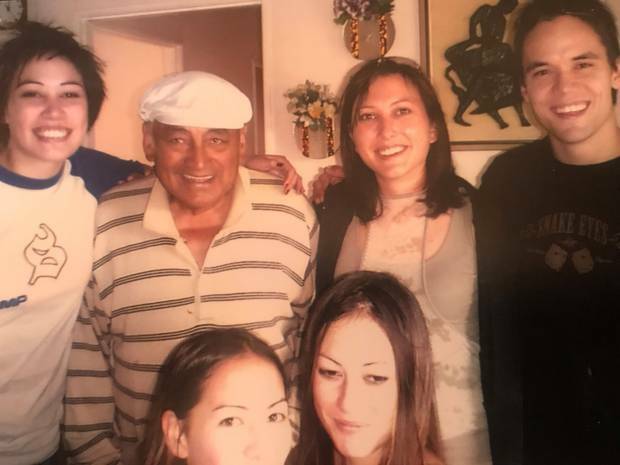 Marisa Bidois, with her grandfather (left) and siblings in Waihi. She then decided to study again, this time towards a Bachelor of Law. At the Restaurant Association, she was first hired to look after professional development. She later took over the employment relations area. After three and a half years she left the Association and went to work for infrastructure company Transfield Services, working in employee relations. “I’d been in that role for about a year and a half and the board at the Restaurant Association said the CEO role was free and they’d really like to see me apply,” Bidois says. At age 33 she became CEO and has now been in the role for seven years. Today, Bidois manages a team of 20 and oversees support for about 2300 association members. She describes the organisation’s role as a “silent business partner” and “cheerleader” for its members. Among the many issues facing the sector, one is that many New Zealanders just aren’t interested in getting into hospitality. “People see being in the industry as a stop-gap in the career, or do it while they’re studying before moving on to other industries. People say that it’s low wages and unsocial hours but for every one of those points there are so many counter-positives,” she says. Bidois says the industry is great at giving workers first-hand experience at managing people. “You get an opportunity to get a lot of experience in a lot of very core skill sets to leadership – being able to relate, negotiate, communicate and to be able to think clearly when you’re faced with a challenging situation. Bidois considers a successful day in the office as one when she has been able to make a difference or influence legislation affecting the industry. She says her team at the association were instrumental in shaping the last immigration reform in 2017, lobbying to lower the minimum annual salary required for overseas workers and ensuring chefs stayed on the skill shortage list. The hospitality industry in New Zealand is unique, Bidois says. “I travel a lot overseas, not just the States, but Australia, Europe, and New Zealand has something very unique because it is a dynamic industry – it’s very creative. One of the association’s goals is to encourage food tourism, and it is working on that with Eat New Zealand, a group trying to encourage culinary travel. Bidois has always been passionate about food, people and hospitality. She says she grew up with a strong connection to the concept of Manaakitanga, which she believes has subconsciously shaped her decision making.